This is our standard 4in Rotary Table fitted with one of our 180Ncm Hybrid Stepper Motors. 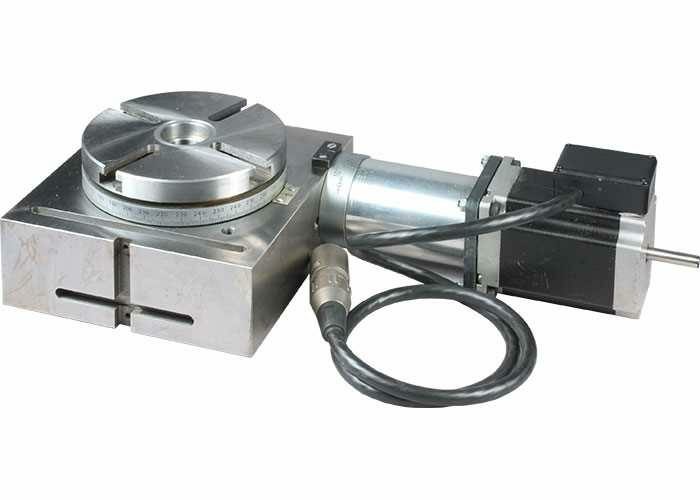 The motor is wired with a robust 4 way XLR plug, ready to connect straight to the 4th axis socket of a KX1 or KX3 CNC machine, into a DivisionMaster Indexing Controller or connected to a bipolar stepper drive and used as a fourth axis on your CNC system. The worm is fitted with Needle Roller Thrust Bearings to minimize backlash and may be adjusted for wear in the future. Complete with Chuck Backplate for a Chinese 80mm 3 jaw or 4 jaw chuck or 95mm ER25 or ER32 lathe collet chuck, 2 Hold-down Clamps and 4 T-Nuts.